The nonlinear static responses of the skew sandwich flat/curved shell panel including the corresponding stress values are examined in this article under the influence of the unvarying transverse mechanical load. To evaluate the said responses of the sandwich panel, the physical structure model turned to a mathematical form via a higher-order kinematic theory including the stretching term effect in the displacement field variable. The effect of geometrical nonlinearity has been included via Green–Lagrange strain–displacement kinematics. The governing equation has been derived from the variational principle and is solved via direct iterative technique including the finite element procedure. 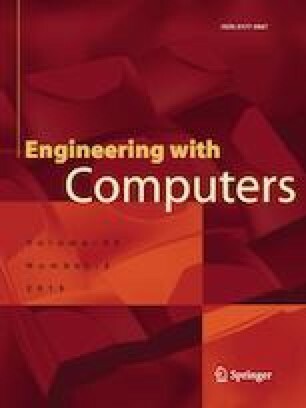 Further, a customized finite element computer code has been developed in MATLAB environment based on the current mathematical model for the computational purpose. To check the comprehensive behavior of the proposed model, the bending responses are obtained for different mesh sizes and compared with the published data (numerical and 3D elasticity solution). Subsequently, a wide range of numerical examples have been solved for the different geometrical configurations (side-to-thickness ratio, curvature ratio, core-to-face thickness ratio, skew angle and support conditions) and the influence of the same on deflection and stress behavior has been shown and discussed in detail.